What's the best way to measure how much Spaghetti/Linguini is 1-portion. I know there are tools which basically measures the diameter of the bundle of dry spaghetti. But are there simpler tricks which don't require any tools? Well, one obvious answer is to look at the number of portions in the box. (This is found in the nutrition information.) Then divide the amount in the box by the number of portions. I just pulled down a box of linguine from my shelf. One pound yields eight 2 oz. portions. Which means all you have to do is divide in half three times. It won't be exact, but you'll get pretty close. Italians weigh it and it's really the only fail-safe way. Using a kitchen scale with a big bowl on top should work for just about any pasta shape. 40g for a small portion, 100g for a big plate full. Cooked volume will depend on the type of pasta, but with spaghetti for example about 55g of dry will produce about 1 cup of cooked spaghetti. I have a Joseph Joseph spaghetti measurer. It looks like a camera aperture and measures up to 4 servings. Count them! 100 spaghettis are a good portion (100g circa) for 1 person. As for linguine, since they're a bit thicker I would go with 75 of them. 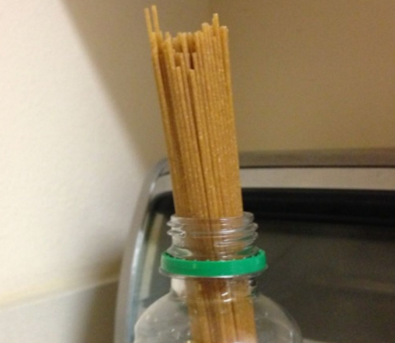 One cup of cooked spaghetti noodles is one portion. One plate or half of 2-cup bowl is about 1 cup or 125g of spaghetti noodles. Unless you really are hungry you probably cannot eat more than 2 whole portions. fyi... 1 portion of noodles is about 200 calories. One quick, simple way is to use the cap from a spice container that you would buy at the supermarket, and probably have a half dozen or so in your cupboard. Not the answer you're looking for? Browse other questions tagged pasta measurements spaghetti or ask your own question.